I am passionate coder, proud father of 2 boys, and avid fisherman. I’ve also been known to dream in code every now and then. 2014 is the first year I decided to make a large effort to grow many of my own veggies and plan on continuing that in the coming years as I take pride in it and it’s fun. I have found it enjoyable as well as nutritious. The hard part is managing enough planter space in the concrete jungle of the southern California home I live in to maximize the yields. None the less, I enjoy the cultivation process and harvesting reward. I have dabbled in everything under the Sun but the 2 languages I gravitate to are C# and PHP. These are my strongest languages and yet I am not afraid to try anything new. I have more professional experience in web (years wise) but I have been known to bust out backend console, services, and forms applications if the job calls for it. I fish both fresh and salt water for fun. It’s one of those things for me that you find in life, that if you love it, you should do what you love … and that I am. 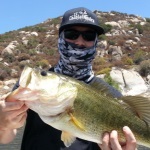 I fish with a buddy of mine as an amateur team in the tournament series run by SWBA (Salt Water Bass Anglers). Our team is named Coastal Nostra. If I have learned anything about fishing it’s that more time on the water typically yields better results. I think we would like to be able to spend more time on the water although it’s hard when you are weekend warriors.